Synthetic peptide corresponding to Human NPR-C aa 67-97 (N terminal) conjugated to keyhole limpet haemocyanin. 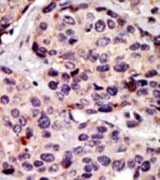 WB: HL-60 cell lysate IHC-P: human breast carcinoma and kidney tissues. ICC/IF: HeLa cells. Our Abpromise guarantee covers the use of ab37617 in the following tested applications. WB 1/100 - 1/500. Detects a band of approximately 63 kDa (predicted molecular weight: 60 kDa). Immunohistochemistry (Formalin/PFA-fixed paraffin-embedded sections) analysis of human kidney tissue labelling NPR-C with ab37617. Tissue was fixed with formaldehyde and blocked with 3% BSA for 0.5 hour at 38°C; antigen retrieval was by heat mediation with a citrate buffer (pH6). Samples were incubated with primary antibody (1/25) for 1 hours at 37°C. A peroxidase-conjugated Goat anti-rabbit polyclonal (ready to use) was used as the secondary antibody. 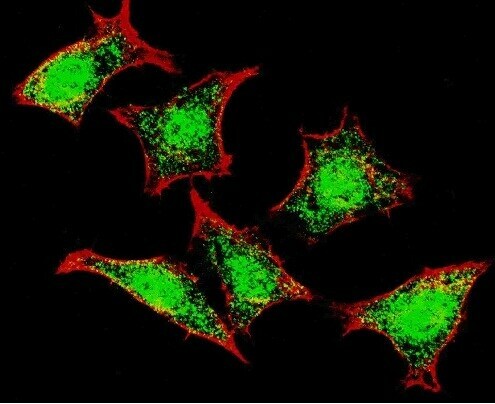 ab37617 staining NPR-C in the Human HeLa cell line by ICC/IF (Immunocytochemistry/immunofluorescence). Cells were fixed with 4% paraformaldehyde and permeabilized with 0.2% Triton X-100 in PBS for 30 minutes. Samples were incubated with primary antibody (1/200) for 2 hours. 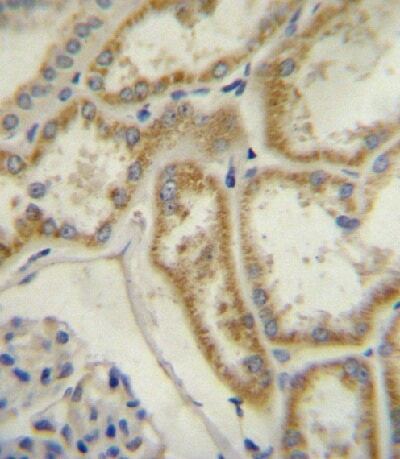 An Alexa Fluor®488-conjugated Donkey anti-rabbit (1/1000) was used as the secondary antibody. ab37617, at a 1/50 dliution staining human breast carcinoma by immunohistochemistry, formalin fixed paraffin embedded tissue, followed by AEC staining. Publishing research using ab37617? Please let us know so that we can cite the reference in this datasheet. I am enclosing the questionnaire answers and images you asked me. Thank you very much for providing that information. It has been very helpful in understanding the results you have seen so far in your experiment. I am sorry but Kate is currently away from the office but I will try my best to help you with these problems. It is clear that you have put a lot of effort in to try and optimise the results with these antibodies. It is regrettable that the results so far have not been as hoped. Would you mind clarifying a few further details for me in order to more fully understand what may be contributing to this? 1. You have mentioned that you have purchased three antibodies from us. Is the third one working as expected? Which antibody was this? 2. Have you been performing any staining of the tissues with any other antibodies? How has this staining performed? 3. How were the tissues fixed (time and temperature in formalin)? 4. Can I ask, the antigen retrieval, am I correct in thinking you tried the three different buffers individually, each for 20 minutes at 97oC? How was this performed, in a microwave or pressure cooker etc? You also mentioned it being performed for 30 minutes, 1 hour, 2 hours and overnight, could you clarify this? Once I have this information I hope to be able to understand more fully what may be contributing to the staining observed currently. look forward to receiving your reply. I am using human breast carcinoma tissue as positive control for NPR3 antibody and skin (keratinocytes) as positive control for SFRP1 antibody (like descripted in your datasheet). I started my reactions with 1:200 concentration for NPR3 and 1:2000 for SFRP1, as suggested by Michael Taylor, MD in his paper "Medulloblastoma comprises four distinct molecular variants". However, after five differents attempts (over night, 60 minutes and 1 hour of incubation, with Ultra Vision Plus detection (Thermo)), I think this protocols worked better: 1:50 concentration for NPR3 with 2 hours of incubation, pH 6,0, antigen retrieval in PT-Link (DAKO) and DAKO detection. In case of SFRP1, I did the same protocols above with up 1:500 in concentration and I didn't get any staining. Please find the best images attached. Thank you for taking the time to contact us. I am sorry to hear you have had difficulty obtaining satisfactory results from these antibody. I would like to reassure you that our antibodies are tested and covered by our 6 month guarantee for the tested species and applications listed on the individual datasheets. In the event that a product is not functioning in the tested applications and species cited on the product data sheet (and the problem has been reported within 6 months of purchase), we will be pleased to provide a credit note, free of charge replacement or refund. I would like to investigate this particular case further for you, and also obtain more information for our quality monitoring records. In order to proceed with this, I would appreciate if you could let me know which application you have been using. Also which type of samples you have tested. Once I know which application you are using, I can obtain the protocol from the laboratory and will be pleased to send this on to you. I would also appreciate if you are able to provide an image which would help us to assess the results. Thank you for your time and cooperation. I look forward to hearing from you with the requested information. My name is Gisele and I bought three antibodies of Abcam but two of them aren´t working: SFRP1 (ab4193) and NPR3 (ab37617). I did several protocols but I haven´t got satisfactory result. I would like to get your protocols for these antibodies to repeat my reactions. Thank you for taking the time to reply with the information. I would like to reassure you that ab4193 is tested and covered by our 6 month guarantee for use in IHC-P and human samples. In the event that a product is not functioning in the applications cited on the product data sheet, we will be pleased to provide a credit note or free of charge replacement. Although the other antibody has worked well using this procedure, individual antibodies will often require optimization. Before deciding how to proceed, I would like to investigate this particular case further for you, and also obtain some further information for our quality records. In order to do this, I have enclosed a questionnaire below. I would appreciate if you could complete this. It will help you put the information we require together very easily. I have completed the sections for which information has already been provided. In the event that a product is not functioning in the tested applications and species cited on the product data sheet (and the problem has been reported within 6 months of purchase), we will be pleased to provide a credit note, free of charge replacement or refund. What different incubation times and buffers been tried for antigen retreival to optimize? Please confirm what other dilutions have been tried. Is the current vial of secondary antibody working well with other primary antibodies? I bought three antibodies of Abcam but two of them aren't working: SFRP1 (ab4193) and NPR3 (ab37617). I did several protocols but I haven´t got satisfactory result.